So far I’ve read the first three chapters, and I’m just as impressed by the Harris boys’ work as I was on their first book. The target audience is definitely teenagers, so some of it takes some translating to make it apply to my situation (changing “homework” to “my job” and “chores” to “housework,” etc. ), but the messages are still very good. “Pursue faithfulness, not success” (4). “When your heart and mind are alert, you can see opportunities to do hard things in everyday things” (9). “Remember, neither fame nor obscurity is the goal. The goal is obedience to God, effectiveness in whatever He gives us to do, and a heart that glorifies Him” (21). And that’s just in the first two chapters. Chapter three is when the book really launches into the practical tips for making a great idea work. I began taking notes as their ideas and guiding questions helped me bring my vision into focus. What would I do if I had unlimited time and unlimited resources? What could I do toward reaching that goal with the limitations I face? What do I bring to the table, and where do I need help? What are others already doing? What can I learn from them? Who knows more about this than I do? Where do I want my project to be a year from now, and what do I need to do to get there? I started by neatly writing out each question, but as I answered them, my note-taking turned into furious scribbling as I sorted through my ideas. What was good about these questions is that the finally forced me to look at the step-by-step process of what I’m trying to do. What is my end goal, and what do I need to do to get there? I won’t copy all my notes here, but I determined that I what I really want to do is this: combine strength-based training with career-placement explorations and bring it to the high school level in order to give teens an exciting focus for their futures. I’m still brainstorming the nitty-gritty of what that would look like and how to make it happen, but that’s my idea… for now. Finally, near the end of chapter three a passage jumped out at me. 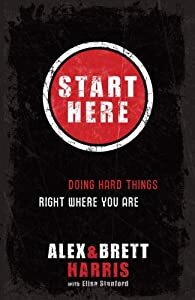 I know I’m not the teenager that Brett and Alex had in mind when they wrote this, but I want to take this on as my mission as well – to ignite the desire of every teenager to become a rebelutionary, whether they’ve heard that term or not. What about you? What would you do if you had unlimited time and resources?